In our pipeline style metal separators series, we have two styles, the pipeLINE™ system is used for liquids or pastes in pressure conveying lines. Designed to remove ferrous and non-ferrous metals from liquids, pastes, or slurries. Various sizes available, and works well many different types of products. Custom designed system fits any pipeline application requirements. Built to your specifications and comes ready for installation. 3-way separation mechanism is suitable for both pneumatically-driven pig cleaning and Clean in Place (CIP). 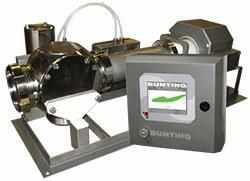 Features 05 or 07 controls, the most advanced metal detection controls, delivering superior results with ease of use.